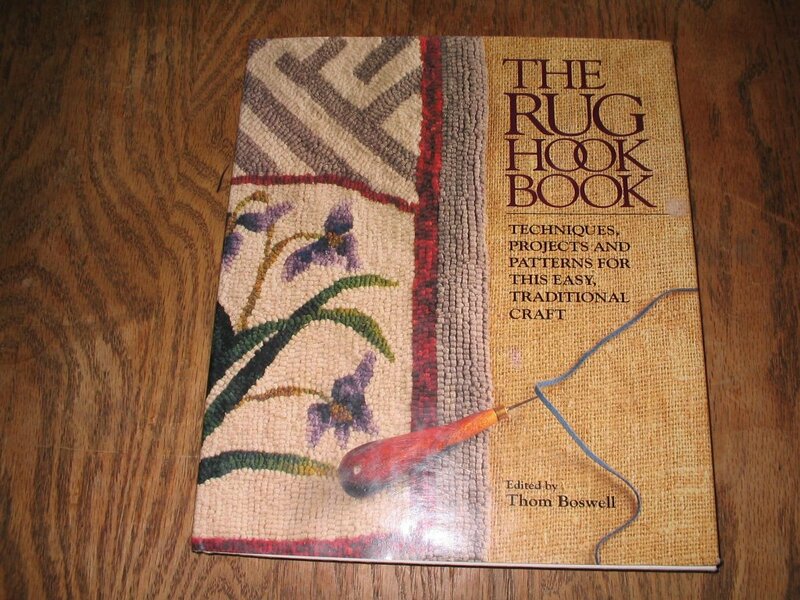 Two more of my favorite books are Hooked Rugs, An American Folk Art, with Ten Patterns for Rugs to Make by Leslie Linsley, published in 1991, and The Rug Hook Book, Techniques, Projects and Patterns for this easy, traditional craft edited by Thom Boswell and published in 1992. Both books would work as textbooks for an interesting class on rughooking - they are pretty complete as far as offering everything a beginning rug hooking would want to know. 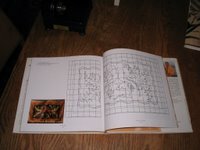 The history, pictures, and patterns are also very interesting to experienced hookers. I once made a huge mistake with the Linsley book and I still kick myself about it. In a bookstore in Ann Arbor, where publishers overruns and discards are sold, I found a stack of the Linsley book. I loved it right away and thought I could probably sell a few of them in my shop, so I bought a few of them - at, if I remember correctly, nine dollars each. I priced them at $25 and sold all but the one I wanted to keep right away. I had a large group of hookers at the store for the weekend, and somehow, during the weekend, my copy of the book disappeared. 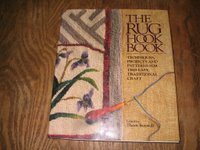 I decided I had to have a copy of it, so I started searching on the internet and discovered that most copies of Hooked Rugs were selling for around $90. I have been searching for copies ever since. 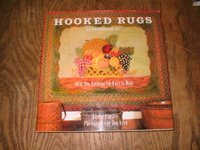 It's been about seven years, and I now have three copies of Hooked Rugs. I paid through the nose for the first copy and bought the second and third because the price had dropped a little. One copy was under $50, but I had to wait six weeks for it to come from Belgium. 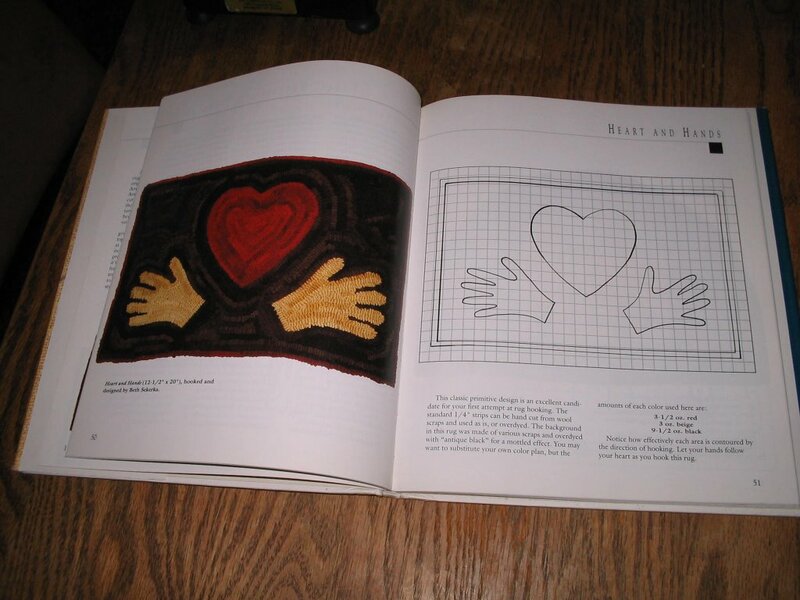 The heart and hand pattern pictured is one available in the book, and the bird pattern is another, derived from a 1920 painted pattern. The Boswell book has more patterns and more detail and is a lot easier to find at a reasonable price, but somehow it doesn't appeal to me in the same way as the Linsley book. 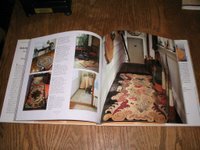 The Rug Hook Book has an offering not available in the Linsley book, it's a gallery of rug hooking artists - pages about some of the more well known rug hookers with photos of some of their rugs. 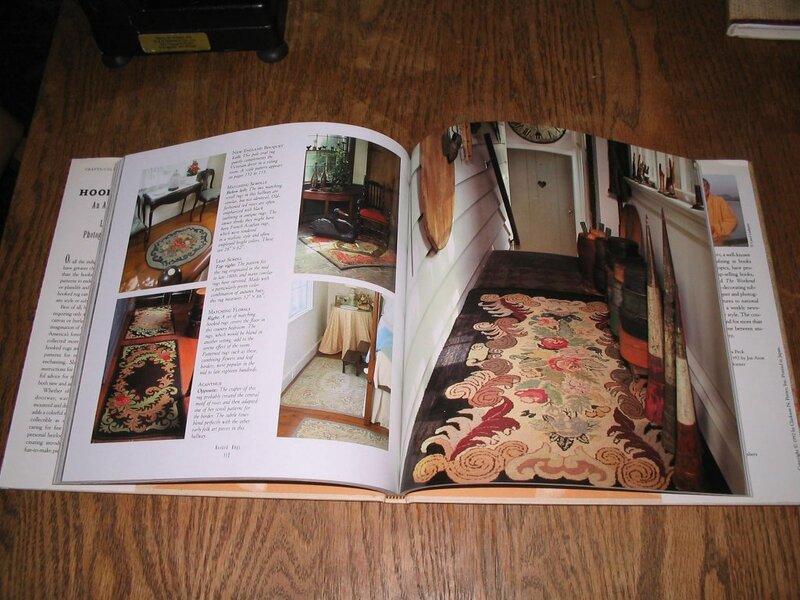 The pages that are shown in the photo on this page are about Marion Ham who designs and hooks primitive rugs that look very much like the old antique rugs. 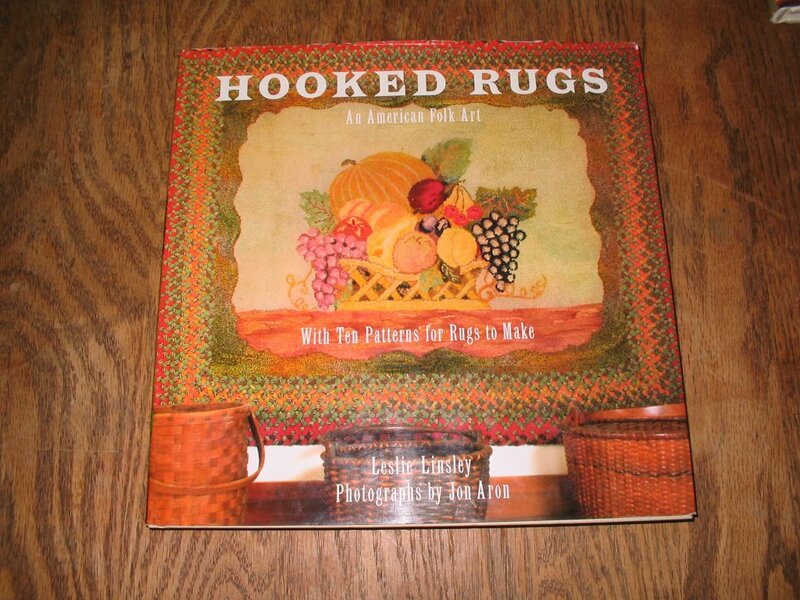 Learning about some of the well known members of the rug hooking community offers an understanding of the variety and creativity available to rug hookers. I just wanted to thank you for incorporating books on your blog. I love the history and the illustrations for the antique rugs. They are such an inspiration. I especially like the primitives ones. You are such a fountain of information and so willing to share. I can see my library want list growing. I will eagerly wait for your new additions! !